Lance Corporal 11883 Charles Hughes, 4th Company, 11th Battalion, Worcestershire Regiment. 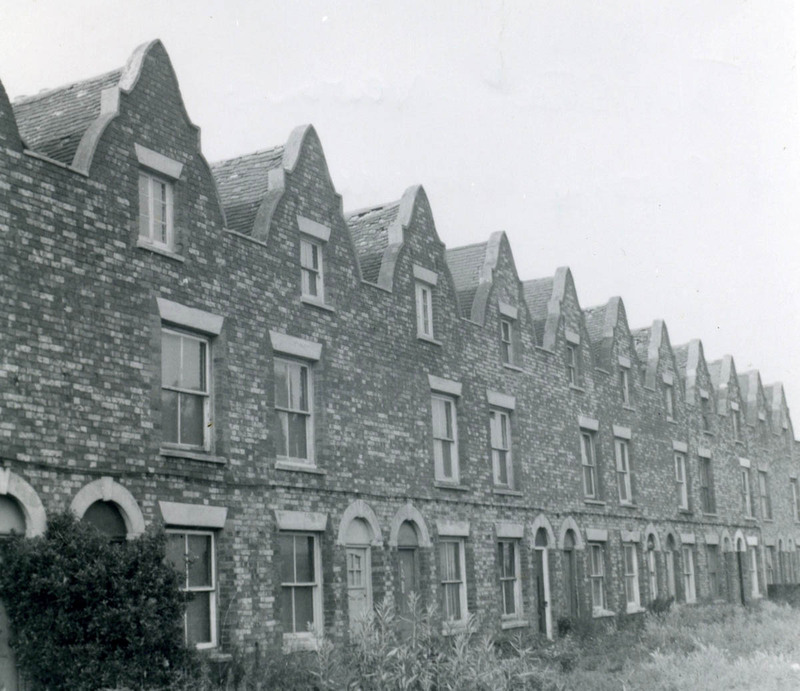 Jack Street, Newbury, shortly before its demolition in 1962. Charles was born in Caversham in 1891 the son of James Hughes and his wife Hannah née Hodges. During their long marriage James and Hannah had twenty-one children, although tragically thirteen died in infancy. The surviving children were: Susan (born 1876 in Hanwell), Richard Crispey (1877 Caversham), Thomas (1879 Newbury), Harry (1881 Newbury), James (1882 Sherborne St John), Joseph (1887 Tilehurst), Charles (1891 Caversham), and Alice May (1893 Caversham). As can be seen from the birthplaces of the children, the family moved around. James was a sawyer, work that was widely available. By 1898 they had settled in Newbury at 25 Jack Street. Charles received a basic education at Speenhamland School. For the first few years after leaving school aged around 13, he probably worked as an errand boy, grocer’s assistant or similar before seeking adult employment. The first such employment on record was also his last employment – by 1911 he was serving as a soldier in the 1st Battalion of the Worcestershire Regiment at Carisbrooke on the Isle of Wight. In 1913 this battalion was sent abroad, trading places with the regiment’s 2nd Battalion, which had been serving in India since 1906 (and previously in Ceylon and South Africa). However, the 1st Battalion was not sent as far as India, instead it was posted to Egypt. 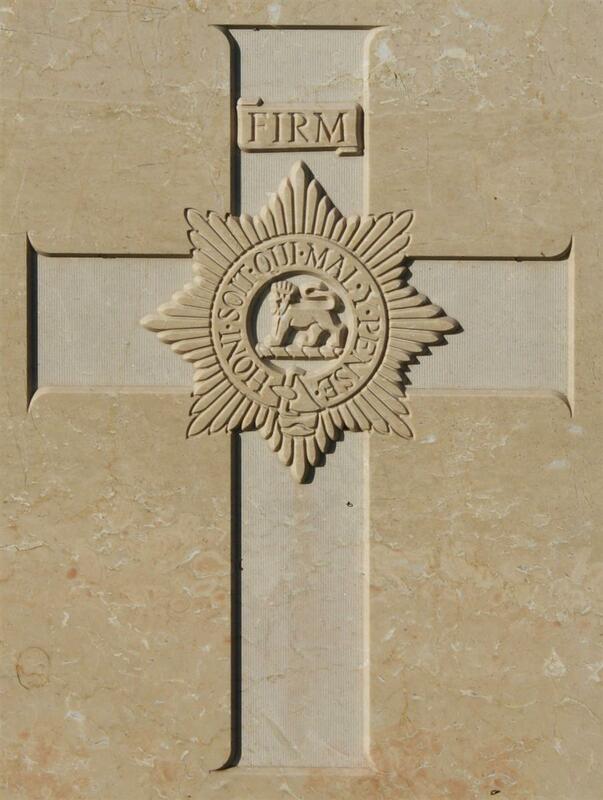 The regimental badge of the Worcestershire Regiment, in the less common version (within the large cross) used on CWGC headstones. Charles’ time in Egypt was cut short when, following the declaration of war in August 1914, the 1st Worcesters were recalled to the UK where they landed at Liverpool on 16 October. The following day the battalion moved south to Winchester where the 8th Division was assembling at Hursley Park. The battalion was placed under the command of 24th Brigade. On 5 November 1914 the battalion crossed to France (earning Charles a 1914 or Mons Star – the mark of the Old Contemptible). The 8th Division arrived at the tail end of the 1st Battle of Ypres and suffered some casualties, mainly from enemy shelling, but were not involved in any serious fighting in 1914. At some point Charles was transferred from the regiment’s 1st Battalion to the 11th. Transfers like this were usually the result of a break in service caused by wounds or sickness. The winter of 1914/15 saw a lot of men invalided home with frostbite, trenchfoot and other illnesses, as well as a steady stream of wounded. Then in March 1915 the battalion took part in the Battle of Neuve Chapelle followed by the Battle of Aubers Ridge and the action at Bois Grenier in September. The army offered its soldiers plenty of opportunities to be wounded. Whatever the cause Charles found himself back in England and posted to the 11th (Service) Battalion as a Lance Corporal. The 11th was one of the many battalions formed from the enthusiastic volunteers of late 1914 – one of the so-called ‘Kitchener’ battalions. It was sent to France in September 1915, amonst the earliest of these battalions to arrive at the front. It was not in France for long; in November 1915 the battalion along with the rest of the 26th Division embarked at Marseille and was shipped out to Greece. An Anglo-French force was sent to Salonika in northern Greece to provide help and support to their Serbian allies, but arrived too late to prevent a Serbian defeat. The force remained in the region for the remainder of the war operating with the remnants of the Serbian army as a front in Macedonia against Bulgarian and Austrian armies. Charles did not join the battalion in the field until mid-1916. Shortly before he left England he took the opportunity to marry his sweetheart, Eva Annie Brown from Old Alresford in Hampshire. In August 1916 the allies (by now supplemented by Russian and Italian contingents) managed to stop a Bulgarian offensive around Lake Ostravo, and limited operations began to push them back. All day of October 11th the British guns kept up an intermittent bombardment against the “Mamelon.” After dark the guns redoubled their fire. The troops moved into position. Half an hour before midnight (October 11/12th) the guns lifted their fire and the attack began. The raiders were met by an intense fire, which checked the front line. Two additional platoons were brought up in support and, with that aid, the attackers charged forward to the enemy’s trenches. Sergeant H. W. Preedy showed great bravery in leading on his platoon after the platoon officer had been hit (Sergt. Preedy was awarded the M.M.). A fierce fight ensued. The enemy’s front trench was cleared and the desired identification was secured from dead Bulgarians (proving the enemy to be of the 9th Bulgarian Regiment). Then retreat was ordered (at 15 minutes past midnight) and the raiders fell back to the British trenches. The losses had been considerable—nearly 60 in all (Killed, 4. Missing, 6. Wounded, 3 officers (Capt. A. E. J. Legge, 2/Lts. C. L. Godson and C. R. P. Corbin (the latter died afterwards) and 44 other ranks)—but the Battalion was heartily congratulated on its success. To that success all ranks had contributed, and not least the Battalion signallers. Corporal A. Burton earned special praise by his work in maintaining cable communication under very heavy fire (Corporal Burton was subsequently awarded the M.M.). Sergeant Charles Hughes, of the Worcestershire Regiment, who has been missing since 12th October 1916, is now reported killed. Mrs Hughes, of Barton Cottage, Old Alresford, last week received official intimation that her husband was killed on that date. His Company Officer, with the Salonika Force, writes:- “His Company was in the first line during an attack upon the enemy trenches on the night of October 12th, and the last seen of him was just in front of the enemy’s wire shouting “Come along, boys!” . He had only been in the Company a short while, but, during that time, he had shown himself every inch a soldier. I am really sorry to lose him.” Deceased was 26 years of age, and the youngest son of Mr James Hughes, of Newbury. This newspaper report is the only evidence of his serving as a sergeant; his substantive rank was lance corporal, but he may well have been an acting-sergeant. As his body was never identified his name is remembered on the Doiran Memorial to the missing of the Salonika campaign. 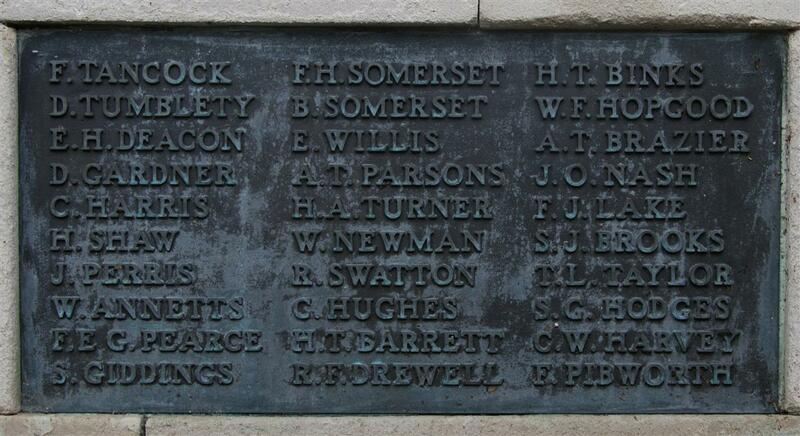 Locally he is remembered on tablet 13 of the Newbury Town War Memorial and on the memorial to the fallen Baptists from Newbury and the surrounding villages in Newbury Baptist Church. He was also remembered on the memorial tablet placed in his old school school in Speenhamland.